Hostelling is uniquely different from the typical tourist travel. Instead of rigid itineraries, private hotel rooms, and pre planned schedules to follow, the backpacker tends to be much more independent and spontaneous. They do not require or desire luxury accomodation, fancy restaurants or package tours. When you decide to use hostels you will not end the day in your private, secluded hotel room. Rather, you will come to a community of like mindedd travelers who share your same excitement for travel adventure. Facilities are shared. 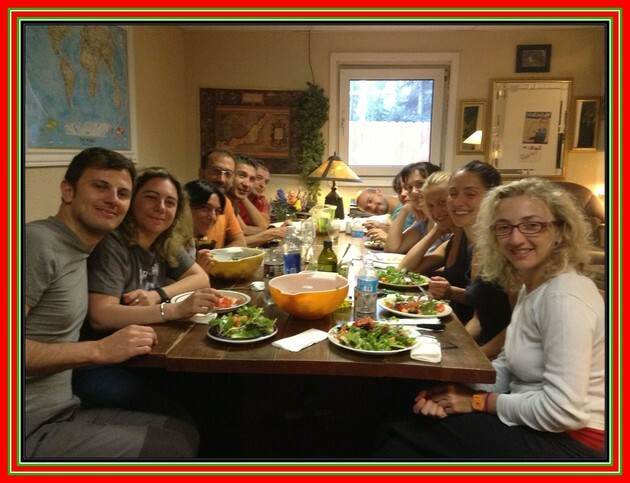 For instance, you will prepare your meals in the company of other international travelers, possibly sharing your different cuisines, or sitting down together in a potluck style dinner. The biggest decision a hosteler has to make every day is trying to decide what to do, or where to go next. One of the great thing about hostelling is that you may get a great idea, or insight from talking to others staying at the hostel. They may have an interesting experience about a place they have just been, or knowledge of a "must do" activity they had discovered, or a special place that is well off the beaten path. Hostellers are NOT concerned as much with comfort or speed. Rather, they look for the road less traveled, that place where they will meet other travelers, enjoy new learning experiences and just doing those things that most tourists never do. Hostellers in general, have more time than money. Hostels & HostellingA Way to Travel for Less Money and Have More Fun! Hostels are not like ;hotels, bed and breakfasts or any other form of accommodation. Hostels are unique in that the facilities are SHARED with other guests. Rooms are usually dormitory style and are usually furnished with bunk beds, (however, many hostels now offer private rooms). Common rooms, bathrooms, kitchens and lounges are shared as well. Because the facilities are shared, the cost for your stay is low. This is very much a communal arrangement. This arrangement allows a warm and welcoming communal camaraderie between guests. A friendly atmosphere is formed between fellow travelers that you just cant find in a hotel. It allows a place where many different people from many different backgrounds can come together and share their experiences. AT Billie's: Rooms have no more than 4 beds, including a summer only outdoor, enclosed (but unheated) gazebo. We also have a couple of private rooms. In General, the hostel is co-ed. There are 3 bathrooms, 2 kitchens, and a lot of common space. Smoking is permitted outside. Some call it backpacking, some call it hosteling. Whatever you call it most agree that hosteling is traveling on a budget while having an adventurous spirit. ; When you stay at a hostel, you see the world from a perspective that few visitors will ever experience. The hosteling experience will allow you to immerse yourself in the local culture on a level you never imagined. As a hosteller, you are able to experience more, on a cheaper budget. Of course Hostelling is not for everyone. But if it sounds appealing to you, then keep reading. AT Billie's: You will meet local 'Fairbanksans' & international travelers just like yourself. This is a great place to meet other travelers, often going to the same places, plan your trip in Alaska, Chat with locals about what its like to live here, or just make friends. People of ALL ages and from all over the world stay in hostels. While the atmosphere at a hostel tends to be "youthful", it really doesn't matter what age you are. Hostellers have an adventurous spirit, are usually outgoing, friendly and eager to share their experiences with their fellow travelers. If you are traveling alone, then Hostels are an excellent place to stay since it allows a way to meet others and share the travel experience. AT Billie's: Generally, you must be traveling to stay here. During the winter months we may accommodate locals who wish to stay longer term. In the summer months, we do not have a maximum stay policy. Stay as long as you like, as long as we like you. Do you need a membership card to stay in hostels? NO !-- While there are hosteling associations that issue membership cards for a fee, Many hostels today are independent (As are MOST of the hostels in Alaska!- including Billie's Backpackers). Hostelling International (HI) is the largest hosteling association in the world and while presenting a membership card will entitle you to a slightly lower price, they will usually issue non-members a guest membership card on the spot. Using the guest membership card, you will pay an extra amount for each night until you have six stamps on your card, after which the card serves as a full membership card. (check for updates as these details can change). AT Billie's: You do not need to be a member of any hostel association to stay here. Most hostels in Alaska are NOT affiliated with any membership paying hostel association, and as such, there are no membership requirements. YES! While every hostel has their own rules, most hostels, require that you be traveling (i.e., not living in the local area). Hostels are not designed to be a cheap place to stay for those in the local community. We are not a "flop" house. But, if you are on the move, traveling, experiencing the community, exploring the state, and from out of town, then you are welcome to stay. AT Billie's: As long as you are traveling, you are welcome to stay here. Some exceptions are made during the winter months. Ask Bilie if you have questions about this. There are as many different hostel atmospheres as there are hostels. Each one has a different scene. Part of the adventure of hosteling is experiencing the variety. Sometimes you find yourself in bed by 9 pm and up at 6 am with the chickens gathering eggs. In others you may party until all hours of the night in a world-class cosmopolitan city and sleep until three the next afternoon. AT Billie's: The best way to describe this is to let others describe it for us. Take a look around the website and see what others have to say, or see comments on Facebook or TripAdvisor. Usually. Again, each hostel is as different as the place it is located. Like us, most all hostels ask guests to respect the rights of the other guests staying there. There is a basic etiquette for staying at a hostel. These are generally common sense ideas and are reflective of living in a communal setting. For instance, respecting other travelers, cleaning up after yourself, or observing quiet time. AT Billie's: We don't really like rules. But, as you may imagine, over the years we have discovered that a few are necessary for the benefit of all. So here they are: 1) Do not leave cooking unattended 2) Respect other guests & their property 3) QUIET time 11PM -7AM!! 4) NO ALCHOHOL (there is a pub down the road) 5) Try not to feed the Pugs.. (they are fat enough!) 5) Have fun while you are here. Hostels are typically dormitory (i.e., bunk style). They will usually provide a pillow and blanket, and you will need to use the hostel linens (some hostels include this in the price, others charge a nominal fee). You many also chose to bring a personal sheet sleeping sack. These are simply a sleeping bag made out of sheets that you bring with you. Generally sleeping bags are NOT allowed in hostels because of health reasons. Its easy for bugs, ticks etc.. to get inside the seams of bags and when you unroll them onto your bunk indoors, they can become a health hazard. Most hostels separate the sexes, but not all. It is very common for men and women to share the same room. Check with the hostel in advance if this is a factor that concerns you. AT Billie's: There are no more than 4 to a room. Each area has its own bathroom. There is a large common kitchen and several common living spaces. We try to separate the sexes, although the high summer season will not allow this sometimes. Space and number of visitors sometimes makes this impossible. If you feel the sleeping arrangement will not work for you, please let us know and we will try our best to accommodate you or make another reccomendation.